Acting New Jersey Attorney General John Hoffman said Thursday former Caesars security guard Izyiah Plummer, Aaron Evans, Nathaniel Greenlee and Donavon Jackson were indicted on first-degree robbery charges. A former Atlantic City casino security guard who used inside knowledge in a gunpoint robbery, making off with more than $180,000 has been indicted along with four others, New Jersey officials said Thursday. Former Caesars security guard Izyiah Plummer along with Aaron Evans, Nathaniel Greenlee and Donavon Jackson were indicted on first-degree robbery and additional charges, according to Acting Attorney General John Hoffman. Dwayne Morgan, 21, of Pleasantville, who lived in an apartment with Plummer, was indicted on a receiving stolen property charge. 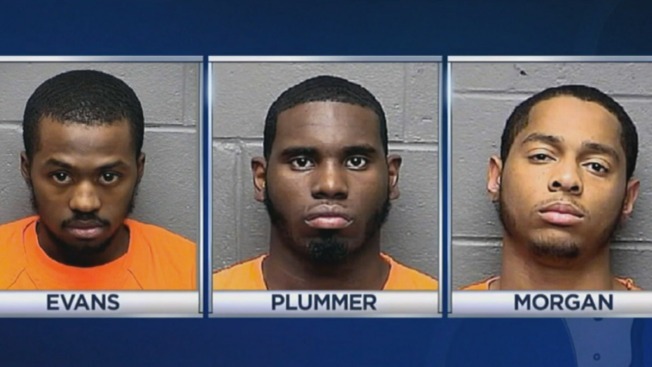 The robbery happened shortly after 6 a.m. on July 21, 2014, when Plummer, 20, and Evans, 25, both of Atlantic City, arrived at Caesars in a car driven by Greenlee with Jackson in the passenger seat, officials said. The robbery touched off a three-state manhunt that led to the arrests last August and included a Delaware State Trooper being shot. The trooper was protected by a bulletproof vest. Plummer and Evans, wearing masks, approached a security guard and another casino worker as they loaded full cash boxes onto a trolley, according to the attorney general's office. Plummer then pointed a handgun at the workers while Evans removed three cash boxes, though, one was dropped and left behind before they left the casino, authorities said. The two boxes contained about $181,200. Greenlee, 22, of Bear, Delaware, then drove them to Plummer's apartment where the proceeds of the robbery were split between Plummer, Evans, Greenlee and Jackson, 20, of Wilmington, Delaware, authorities said. Plummer also gave $5,000 each to Morgan and a second roommate at the apartment. The second roommate, another man and Plummer's girlfriend were initially charged in the case but were admitted to a pretrial intervention program. Messages left with attorneys for Plummer, Greenlee and Jackson were not immediately returned. Evans' attorney declined to comment. It was unclear who is representing Morgan. The defendants were arrested after the robbery and are free on bail, according to the attorney general.